For this task, first clean out outgrown and seldomly used toys. You can donate these toys to a Preschool, Goodwill, or other nonprofit. Another option is to sell at a consignment sale or garage sale. You can store some that your kids haven’t completely outgrown in storage containers and place in storage, so you have toys to rotate in and out. Just not having everything on the playroom floor at once is relaxing and gives your kids a chance to be more creative in their play. Before setting foot in a store or online to purchase shelving or bins, decide how you want to use the space. Most likely, there are different kinds of toys: dolls, trucks, kitchen or workshop areas, puzzles, games. You probably also have a crayons, markers, chalkboards, paints, and other craft supplies that might need their own space. Divide everything up on paper, if only by listing these items, so you can get an idea of what you need. 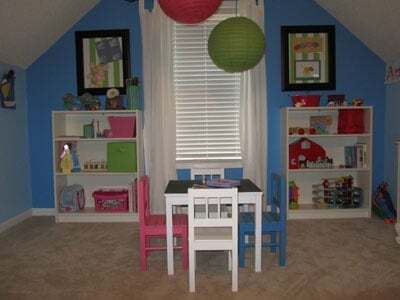 Formal furniture is not necessary in a kid’s playroom for the kids, but the space is more inviting for adults when there is some furniture. Think about placing a futon or sleeper sofa in the room. This beautiful one below is found at Walmart and is perfect for reading a book with Grandma, as well as an inviting place for a sleepover or guests. Ikea Billy bookcases – A good height for the space but not heavy duty. 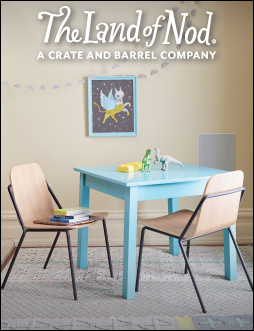 Similar to these, check out bookcases at the Land of Nod. Chalkboard labels are key to keeping everything organized! Chalkboard wall –Chalkboard paint can be bought from your home supply store or from Amazon and will work on multiple projects, like making a chalkboard wall, chalkboard table top, chalkboard labels, or herb pots painted with chalkboard paint for labeling. We outlined a square on the playroom wall and then painted 3 coats of chalkboard paint. After all is dry, add a border. We used contrasting leftover paint from the playroom paint project. Hanging clothesline to hang artwork on the wall- Simply take fishing line and tie it between two hooks. Have your children decorate a few clothespins and then hang their artwork! Additionally, you can display their special artwork in frames.